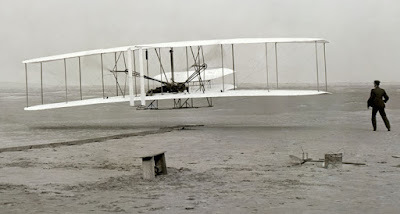 Today’s the day back in 1903 that Orville and Wilbur Wright became the first humans to make controlled powered flights in a heavier-than-air machine, the Wright Flyer. The morning started with a short hop piloted by Orville (a decision made by tossing a coin) lasting just 12 seconds, and covering just 36.6 m (120 ft). This is less than the wingspan of many modern airliners, but it was a success and the rest, as they say, is history. 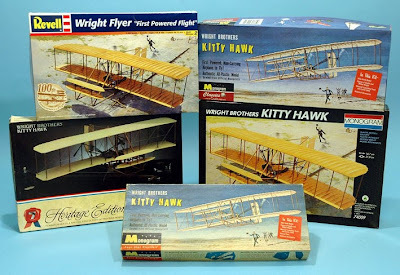 Because of its significance, the Wright Flyer has been turned in many a model, from diecast replicas to plastic kits, and perhaps more appropriately, wood and tissue paper kits. The most comprehensive kit comes from Hasegawa in its Museum Models series. This is 1:16 scale and a ‘multi-material’ kit in that it contains more than one material. Mimicking the original, a lot of the 301 parts are wood and brass with a sprinkling of white metal and plastic. But this model is for the really dedicated, and is not idly called a ‘museum’ model - many actually do end up in museums. It’s not presently in production at Hasegawa, but kits are available from stock in model stores off and online. Probably the most familiar Flyer is from Monogram. Produced in the early days of the company, it first appeared in 1958, and has been in and out of the catalogues over the decades, so one of the issues should still be found easily. It matches the famous photograph of the first flight in that you get Orville at the controls, with Wilbur running alongside. And that isn’t all, for the bits and pieces of paraphernalia visible in the historic photo are supplied too - launching ramp, starter battery, brush in a pot, workbench, even the g-clamp. The only thing against this kit is that it’s to a weird fit-the-box scale of 1:39, but in a diorama setting scale is less important and considering its age, the kit still looks good. So what kits are available off the shelf right now? Not a lot, sad to say, but click the link to find out what Amazon has in store. Best of the bunch is the decent Aviation Archive 1:32 Flyer from Corgi, which comes with figures and takeoff ramp. It’s available at a cracking price here. 1 The original historic photograph, taken on a plate camera. Although set up by Orville, the shot was actually tripped by John Daniels, one of the local life-savers the Wrights roped in to help. 2 Five issues of the Wright Flyer, with the first Monogram release in the front. The Revell kit at top left was issued in 2003 to celebrate the flight’s centenary. 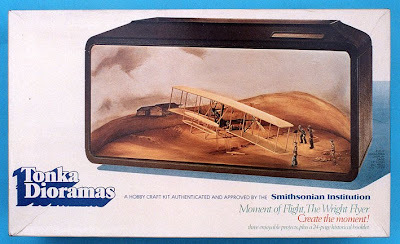 4 Tonka is rightly famed for its tough tin toys; less well known are its kits, such as this Wright Flyer diorama. Photographs of the kits courtesy Mat Irvine.